Hurricane Damage to Businesses | The Voss Law Firm, P.C. Hurricanes are known for being destructive, and many communities along our nation’s coasts have seen the terrifying force of these storms. Businesses, in particular, can struggle to recover from hurricane losses because their properties are so complex and so much is at stake if they must close their doors. For most business owners, it is crucial for their businesses to recover as fully as possible under their hurricane insurance policies. 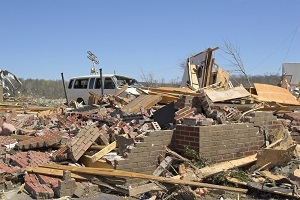 Attorney Bill Voss has helped businesses around the nation recover fair insurance settlements after major catastrophes. To get the most out of a claim, he encourages businesses to take the extra steps needed to understand their coverage and account for all the losses caused by a hurricane, even when those losses are hard to spot. Structures that survive a hurricane often sustain costly losses, especially in the form of damage to roofing and exteriors. These losses often go beyond the surface, potentially affecting underlying materials, heating and cooling systems, interior walls, and more. Although contractors may be pressed for time when an entire community has been affected, it’s important to work with qualified contractors who are willing to take the time to spot deeper damage and investigate common related issues. If undetected damage leads to later losses, businesses may be stuck paying for the repairs out of pocket. Depending on the details of the hurricane insurance policies carried, there may be coverage for these and other losses that affect the flow of business. However, it is up to the policyholder to recognize their rights to this coverage and take appropriate steps to include these losses in their insurance claims. Unfortunately, if you’re not on top of your company’s insurance coverage ahead of time, you may have difficulty getting the funds needed to recover and get on with operations when a hurricane does strike. While physical repairs may be the most pressing priority, you can lose your ability to recover compensation for less-tangible business losses if you lose sight of the full picture, wait too long to claim additional business damages, or fail to organize the needed documentation and assessments. Find out what you need to know about protecting your business and negotiating insurance claims by requesting your free copy of our book, Commercial Property Owners Must Read This Before Filing an Insurance Claim. If you prefer to discuss your situation in a one-on-one consultation with an experienced policyholder attorney, reach out to the Voss Law Firm directly for immediate assistance with your questions.